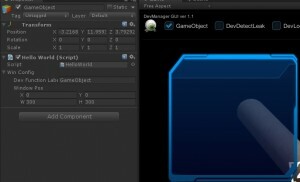 [Optional] for programmer who need to create thier own GUI window by DevManager. 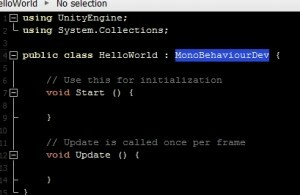 Create your own script, and register GUI window simply just extends a class “MonoBehaviourDev.cs”. and add “HelloWorld.cs” to any gameobject on scene. Now back to the code. override a class call “HandleDebugGUI()” and run the game. Now you got the result like this. about GUI & GUILayout, you may find in here. One more thing, you may needed to know. when using “MonoBehaviourDev” following method will need extends the parent method. base.OnEnable (); // don't remove this line. 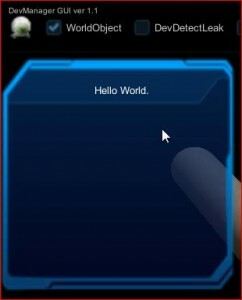 // you can write you code here.